The perfect lunchbox ‘treat’. 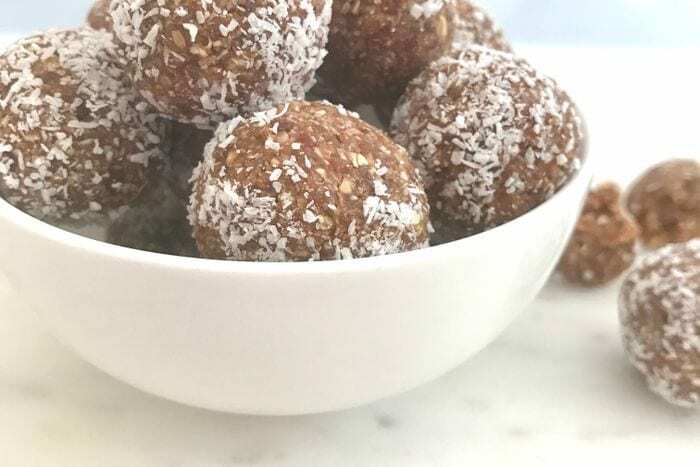 With no added sugar, these nut free energy balls are a nutritious and balanced lunch box addition filled with wholegrain rolled oats for sustainable energy; hunger-busting fibre and protein from the seeds and dates, but still sweet enough to curb that sweet tooth. So simple to make and always handy to have stored in the fridge when you’re feeling peckish. Process rolled oats, cacao powder, dates, 1 cup desiccated coconut and water in a food processor until almost smooth and well combined. Scatter the extra desiccated coconut on a plate. Roll two tablespoons of mixture into balls and evenly coat into coconut. Place on a lined tray in the fridge for 1 hour or until set. Store in an airtight container in the fridge for up to 2 weeks. Do you struggle with lunchbox ideas?